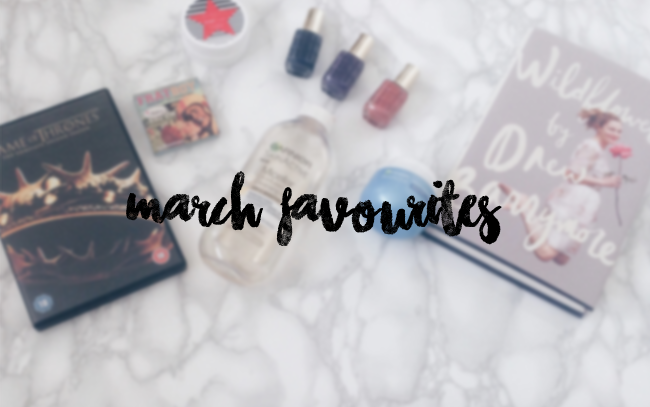 Today I'm bringing you my March favourites. They are mainly beauty/skincare with a couple of lifestyle bits thrown in there. My first favourite is a recent release from Loréal - the Color Riche A L'Huile nail varnishes. I had read a few posts about these and was totally taken by the packaging and array of shades available. I recently visited Boots and couldn't help but pick up three of the shades (Rose Ballet, Bleu Royal and Violet de Nuit). These products are infused with a blend of oils and are so intensely pigmented, that I've found that I only need one coat as opposed to two. Another pro of these nail varnishes are that they come with a wide brush shape, making it so much simpler to apply the product over the whole nail with one stroke. My next favourite is not a newcomer to my beauty stash. The 'Frat Boy' blush from The Balm has been my go-to for the last few weeks. This was the first product I purchased from The Balm and thanks to this, it helped me discover one of my top five beauty brands. I love the cute packaging and the bright coral shade is perfect for this time of year, but it's important to note that it is super pigmented so it must be applied with a light hand - when I first tried this blush, I went a bit crazy and ended up resembling a clown (nice!). Admit it - we all hate cleaning our makeup brushes. Of course it's so satisfying to see that gunk get washed down the sink but the actual process can be an absolute pain. That was, until I discovered this Lottie London 'Soap Star' solid brush cleanser. I was a bit apprehensive to start with, but I decided to bite the bullet and order it from Superdrug. Wow. This has seriously changed the face of brush cleaning in my opinion. I know that there are quite a lot of similar products that cost a lot of money, but this does the job perfectly at only £6.99. I hate the term 'squeaky clean', but that is how my brushes feel once they have been cleaned. All you need to do is dampen your brush and swirl around the soap-bar in circular motions, rinse the brush and then let it air dry. Cleaning my brushes used to take such a long time, now it takes a few fuss-free minutes and I couldn't be happier. Like many others, I'm a massive fan of the Garnier Micellar Water. Upon it's release it really did make a difference to how we all removed our makeup, prior to that I didn't really have a particular product that I used to remove my makeup - but that was back when I didn't really pay attention to what was actually in my skincare; I'd like to think I'm a little more savvy now. Now on to this new release - the Garnier Micellar Oil-Infused Cleansing Water. When I first read about this I got so excited, because using oils to remove makeup is such a quick and easy method and combined with the properties of a Micellar water - I knew it was a must have! This is amazing for my dry skin and it removes eye makeup like a dream - I do still find myself reaching for a second cleanse just to ensure that everything has been removed, but it's definitely become a staple in my skincare routine! Now - on to my new holy grail night cream: Garnier Moisture Bomb Night Cream. I suffer quite badly from dehydrated skin and I can honestly say that this has completely changed the way my skin looks and feels. I've used so many night creams, both cheap and expensive and none of them have ever really done anything for me; this product caters to my every skin need. The cream is extremely combines Amla and Pomegranate (antioxidant superfruits) as well as 15% plant serum. My skin drinks this stuff up and when I wake up, my skin looks so much brighter and feels so plump and hydrated - I'm definitely considering purchasing the day cream. Drew Barrymore is one of my favourite actresses, not only is she talented and incredibly beautiful - she seems to have such a wonderful soul and personality. Reading Wildflower has given me such an insight in to her life, as it's a lovely collection of well written accounts of her life so far and each. I can't remember the last time I read a celebrity's book and actually thoroughly enjoyed it. I've laughed and shed tears while reading it and I'd recommend it to anyone who's a fan of her work. Last but not least, is this absolute gem of a television show - I don't think it needs much introduction. Would you believe it took me until March to start watching Game of Thrones properly? I felt like everyone and their dog was watching this show, but the funny thing is I've actually owned the boxset of season 1-3 since November 2014. I decided to marathon a bunch of other shows before starting this one and it's taken me until this year to do that and I am hooked! I totally understand the hype! Everything from the sets, to the cast, to the costumes, to the writing is phenomenal and I've become so invested in it. I've only just started Season 2 and even though I know the majority of the storylines (thanks to social media), I still find it so intriguing and shocking.